Whoever said that “flying is exponentially safer than driving” apparently never read CALLBACK, the official newsletter of the Aviation Safety Reporting System. The ASRS is a division of NASA that collects and tracks the thousands of "Holy crap, you will never believe that really happened" aviation safety reports candidly filed by pilots, crew, and air traffic controllers each year. Near misses, cabin fires, weird smells, mechanical failures -- it all gets submitted anonymously (to encourage full disclosure without fear of repercussions) in an effort to identify mistakes and improve air safety. And the editors of the newsletter compile the best of the bunch into fun little excerpts that they post online, so we can all read about how close we almost came to dying the last time we flew home for the holidays. Most of the reports are written in pilot jargon, but if you don't mind that, they can be a fascinating (albeit, troubling) read. That's why we decided to sift through a decade’s worth of CALLBACK newsletters to find the 15 scariest, funniest, or just flat-out ridiculous reports they’ve published. Note: Because of the aforementioned jargon, these entries have been (sometimes heavily) edited for clarity. The field conditions were snow depths of 1/2 to 1in. I saw a snowplow on Taxiway A, but I did not hear any ground vehicles using the CTAF [Traffic Advisory Frequency]. Visually checking the final approach path and the runway -- and neither seeing nor hearing any traffic on CTAF -- I commenced the takeoff. 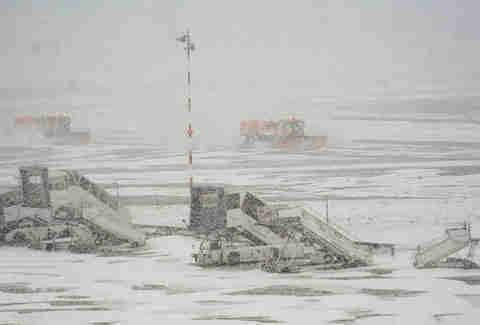 During the takeoff roll, a snowplow entered Runway 30 from the crossing runway. The snowplow turned right, making a 90-degree turn towards me. When I saw the snowplow pull in front of me, I was at rotation speed and continued the takeoff. I would estimate that I crossed over the snowplow by 100ft vertically and less than 50ft horizontally. The wing's just some missing bolts. NBD. On completion of the flight, a passenger seated on the left side of the aircraft asked to speak with us on the jet bridge. The passenger presented us with a drawing of the left wing and stated he saw missing or detached rivets and a loose wing panel just forward of the flight spoilers. We presented the diagram to maintenance. Aircraft mechanics confirmed rivets were missing/pulled through and a wing panel was loose. While on the ground it looked normal. Only in flight did it lift away from the wing structure. Needing to do some electrical work, I told the flight attendant, “It is not OK to board. Please hold boarding.” And I heard her relay that message to the gate agent. I also informed the flight crew and the flight attendants that I had to go down into the E&E [electrical and electronic] compartment to do a test… and for them not to let anyone near this area. At that point I proceed to go into the E&E compartment through the floor entrance [near the main entrance door]. Shortly upon entering the E&E compartment, I heard a noise. I looked to my right and that’s when I realized that someone had fallen into the E&E compartment. I asked the passenger if he was OK, and he confirmed that he was. After a minute or two, the passenger stood up, and I watched him as he climbed out of the E&E compartment. I don’t know who allowed passengers to start boarding. At 8,000ft, we experienced a near collision with a turboprop crop duster. The other aircraft was coming from our 11 o’clock position and traveling northwest to southeast. It passed 300-500ft in front of our aircraft and less than 100ft above our altitude. The duster was so close that we could feel its wake turbulence as it flew by. Our collision avoidance system was operating and showed no other aircraft. Center and Approach Control gave no traffic warnings. No evasive action was taken as the encounter was over before we could take any. Level at 33,000ft... a strong odor similar to paint thinner was detected by both pilots. Cockpit crew initiated a fume checklist. After securing mask and goggles, cockpit crew established communications with flight attendants. The number one flight attendant reported that he also smelled a strong odor and a flight attendant in the aft of the aircraft also reported an odor. 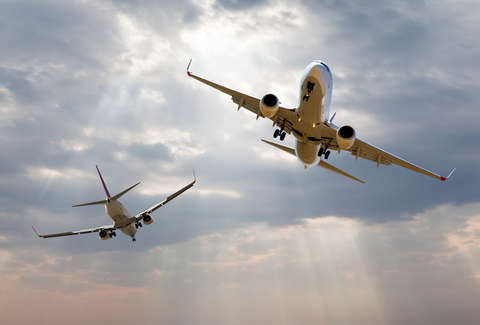 Since we were not able to determine the source of the strong odor, and considering that all of the flight crew reported noticing the smell, the flight crew determined that an emergency should be declared, followed by a divert to another airport. After declaring the emergency, ATC [Air Traffic Control] cleared the flight to turn 180-degrees. As the aircraft was in the turn, the number one flight attendant called the cockpit and informed the crew that the source of the fume-like odor was identified. Apparently, two children sitting in first class had just begun to color with ink markers. A pilot was cleared for a visual approach to Runway 18 and was told to follow traffic. 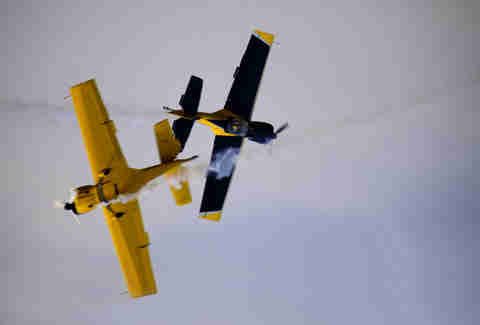 The pilot said that he had the traffic in sight and would follow the traffic. He then descended and landed on Runway 18 at an airport six miles north. When the pilot called (radar approach control), he was asked what happened. He advised that when he turned behind the traffic to follow, he was lined up perfectly for Runway 18 at the other airport, got focused on the runway, and just landed there. 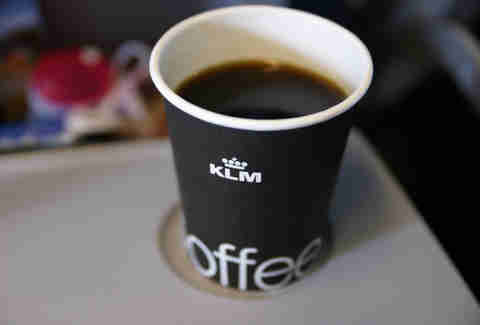 "As I am getting into the just vacated left seat, holding my just poured and still very full coffee cup, kaboom, coffee all over the center pedestal. As we rapidly tried to clean up the mess, the left and center audio panels, begin to look like Christmas trees. What we did not know was that we had gone hot mike to Air Traffic Control. All of the ruckus and commotion in the cockpit was being intermediately transmitted. Well, shades of 9-11, they almost launched the fighters on us. We quickly got a text-message off to Dispatch through the Satcom having them advise ATC of our situation." Rule No. 1 of night flying: turn your lights on We had just landed on our first leg of a multi-engine/commercial training cross-country. We taxied back to the active runway making all of the appropriate radio calls. After applying full power and reaching about 30 knots, we saw a light twin taking off in the opposite direction with no lights on except a red anti-collision light, which from the distance had been mistaken for an obstacle light. We throttled to idle and applied full brakes. The opposite direction traffic passed overhead by approximately 20ft. Approach Control told us there was air traffic at our 10 to 11 o'clock, 400ft below us and not in communication with air traffic control. It was going to pass from our left to right and our paths were going to cross. I asked the first officer to ask for a left deviation, which was approved, and we turned 10 to 15 degrees to the left. On the new heading, I thought I saw additional traffic at our 12 o’clock. I asked the first officer if he saw anything, and he replied, “No.” I looked at the TCAS display and no traffic was shown there either. I continued to look… I started to make something out and said, “It looks like a big bird.” The first officer replied, “Yes, I see something too.” About that time, the object came into focus as it made a left bank. 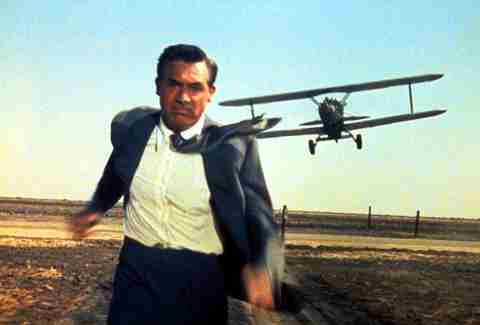 I could tell then that it was a hang glider and we were on a collision course at a high-closure rate. I immediately disconnected the autopilot and made a descending right turn. 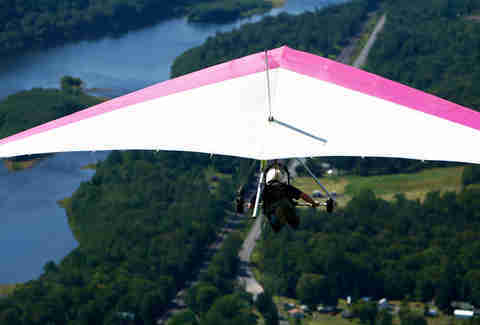 The hang glider passed off our left wing within 500ft horizontal and at our altitude. We informed ATC of the near miss and they were just as surprised as we were to hear of a glider at that altitude. During climb out... we were in heavy rain and massive St. Elmo’s fire, lots of lightning and moderate chop/turbulence. After several minutes of this there was a strong burning smell in the cockpit. The smell got stronger, then my altimeter failed... We then got a "rudder ratio" and "mach speed trim" warning on the EICAS [Engine Instrument and Crew Alerting System]... More electrical instruments seemed to be failing or giving false information on my side and the problem was spreading to the co-pilot’s side. There were more EICAS warnings than we could read. Then the autopilot did a pitch up of over 10 degrees, I disconnected the autopilot. We declared an emergency to return to the airport. The problem [was], the radios seemed to have failed. On standby instruments, I slowly turned back. After repeated calls, the radio started to work and an emergency was officially declared. During this time, instruments were starting to come back, one by one. The burning smell was also going away. All warnings started to go away and everything worked normally. We landed overweight, but the landing was extremely smooth on a very wet runway. While the first officer and I were looking out the right side of the aircraft, the cockpit jump seat rider said, “There he is; straight ahead.” As I turned to look out the front window, the jump seat rider started yelling, “Climb! Climb! Climb!” The first officer immediately started a climb. Another aircraft, not shown by TCAS, flew under our right wing at approximately 100-200ft. As the other aircraft passed, the TCAS announced “clear of conflict” and showed a yellow diamond at our position, even though it never issued an RA [Resolution Advisory] or a TA [Traffic Advisory]. Neither I nor the first officer saw the traffic. The observer said it was a red and white twin and it was close enough that he could see into the cockpit. I noticed something to my left. I looked and saw a Cessna through the captain’s window. It was very close, and I feared a collision. The Cessna was in a shallow left turn, descending. It was less than 100ft away and we had wing tip overlap. I thought quickly about my options and to go around meant that our wing would hit him. If I turned right in avoidance, my left wing would have come up to impact the Cessna. I believed the only option was to continue straight and duck under him. I could not use much pitch input for fear of impact with the ground. The Cessna had overshot its final approach and had come into our space. We were at reference speed plus five knots so we passed him very quickly. 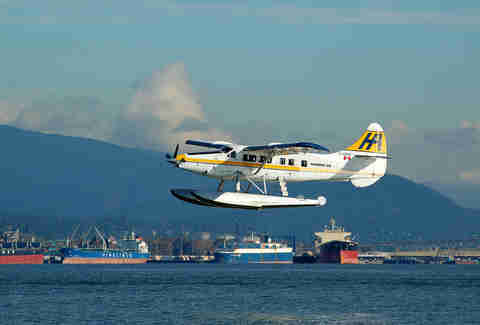 At the end of a passenger-free ferry flight, the aircraft touched down smoothly. At 80 knots, the captain took control of the aircraft with reverse at idle, and the auto brakes disengaged. At this point a catering cart entered the cockpit at an extremely high velocity and impacted the center console, simultaneously striking me in the left arm. The cart had temporarily departed the floor and came over the top of the center console. Liquid was dispersed all over the cockpit and we smelled something that appeared to be burning. The captain maintained control of the aircraft and exited the runway at our assigned taxiway. We assessed the damage. The panel lighting on the center console was inoperative and the structure of the console was bent slightly. The cart also had major structural damage, as well as minor damage to two cabin seats. We concluded that this could have been prevented if we had secured the flight deck door prior to departure. We neared flying speed while taking off in a seaplane just as a cigarette boat traveling at a very high rate of speed came around the corner under the bridge and was upon us. I believe the boat operator noticed us just in time, but because of the speed he was carrying, he could only alter his course slightly. However, in doing so, he cut right in front of us. We were traveling too fast to maneuver [in a way as not] to create a hazard to the other boat operators or ourselves, yet too slow to fly. When we hit his wake, we became airborne. We grabbed a hand full of flaps so [as] not to slam back into the water. We accelerated to a speed… too slow to climb above the bridge beginning to fill our windscreen. We were left with only one safe option… fly under the bridge. We were approximately 5-10ft above the water, 40-50ft under the bridge. I was assigned a block altitude from 17,000 to 19,000ft. I had started my climb up to 19,000ft when I hit severe turbulence. I was knocked unconscious and didn’t recover until 15,000ft. The turbulence smoothed out after that, and I landed. Matt Meltzer is a staff writer with Thrillist and will post any pictures he sees of missing bolts on Instagram @meltrez1.